I love hummus. Seriously, who doesn't? I haven't made hummus in years, because I prefer both the texture and convenience of store-bought hummus. 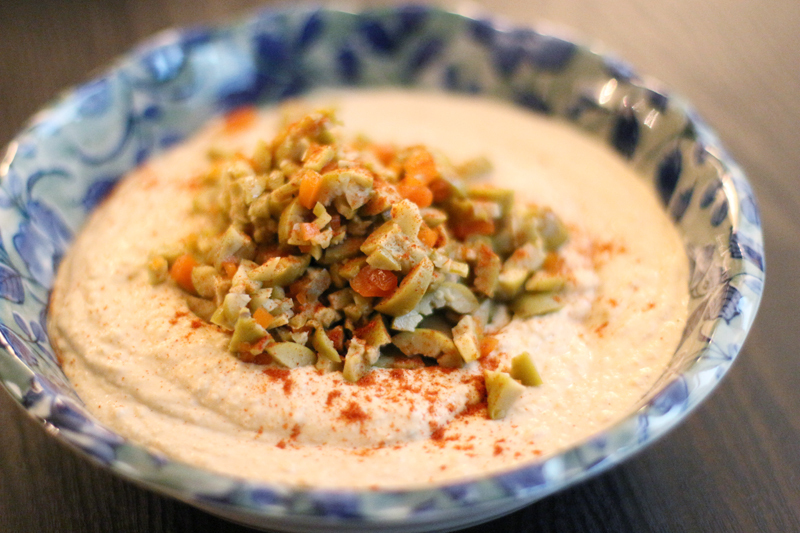 However, store-bought hummus can be expensive and often too salty for my taste, so I decided I would experiment with different hummus recipes during my time off to find my go-to recipe. I started today, and I think I've already found it. Many of the recipes I've tried in the past have called for a can of chickpeas, rinsed and drained. The texture of the hummus never turned out quite the way I wanted. It was often too mealy, and there was also something about the flavours that didn't quite meld together. Last week, I found this recipe, which includes instructions to boil the canned chickpeas for 20 minutes with half a teaspoon of baking soda. I thought to myself that this might be the step I was missing, and I decided to try it for myself. The result was fantastic! The texture is incredible and the flavours are amazing. I greedily scooped a huge helping onto a couple slices of Ezekiel bread and gobbled it down. I pretty much followed the recipe exactly, except I roasted 5-6 cloves of garlic while I was boiling the chickpeas and used that instead of raw garlic. I also used the juice from 1 lemon instead of 1.5 to 2 lemons, but I may try half a lemon next time. I used 4 tablespoons of ice water, and it ended up being a touch too much. Next time, I'll be a little more careful when adding the water. I garnished the hummus with some a lot of chopped pimento olives and about 1/4 teaspoon of smoked paprika. Much, much better than store-bought.